Why I am lurking on this: I only found out about this last week. I haven't read anything by Kate Forsyth yet, but I already have other books of her on my to-read-pile, and this just sounds amazing. There are different covers from older versions, so this is not a first publication, but I like this one best, and I thought I had to feature it, since it's not too long to the publishing date. sounds really good! 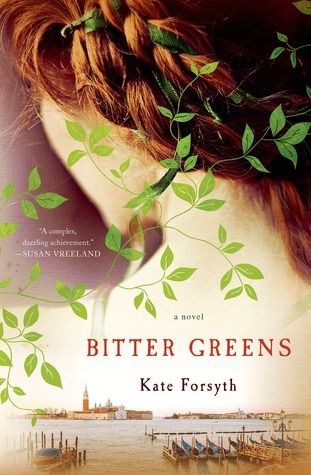 i'm not a big historical reader but i am very intrigued by bitter greens. i love the cover too. happy reading and i hope you can stop by my WoW Post. YES YES YES. I got this from the publisher a couple weeks ago, and I can't wait to get into it!!! This sounds super strange but I kinda like it. I recently realized that I love retellings and this sounds like an original one. However I'm not in love with stories inside stories, I always want to erase one completely. I think I'm going to read a few reviews and decide afterwards. This sounds really great, thanks for sharing!! Sounds like an interesting take on Rapunzel! One of my favorite fairytales. Thanks for stopping by! It has such a pretty cover! I am curious about this one myself! Hope you get to enjoy it!! Oh I adore reimagined fairy tales so this looks right up my alley! Great pick, I'll have to add this to my to-read list! So I assume this story will be told from three points of view. Three women. Three stories. One book. And the coveted vegetable was named this time. This sounds intriguing. Oh, this is a new one for me! It sounds really different, and I don't think I've encountered a Rapunzel retelling before. Great pick, and thanks for sharing it! I have been drawn to this cover all week! Love it! And now I'm seeing the blurb, and I love the sound of it. Thanks for sharing. This is on my TBR also! And I agree, this cover is much better than the older versions.